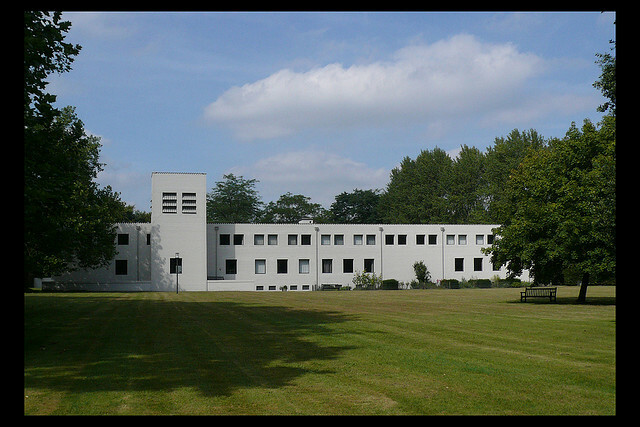 Belgium is blessed with an impressive contemporary monastery, Roosenberg Abbey. The abbey is located in the woods near Waasmunster, close to Antwerp. 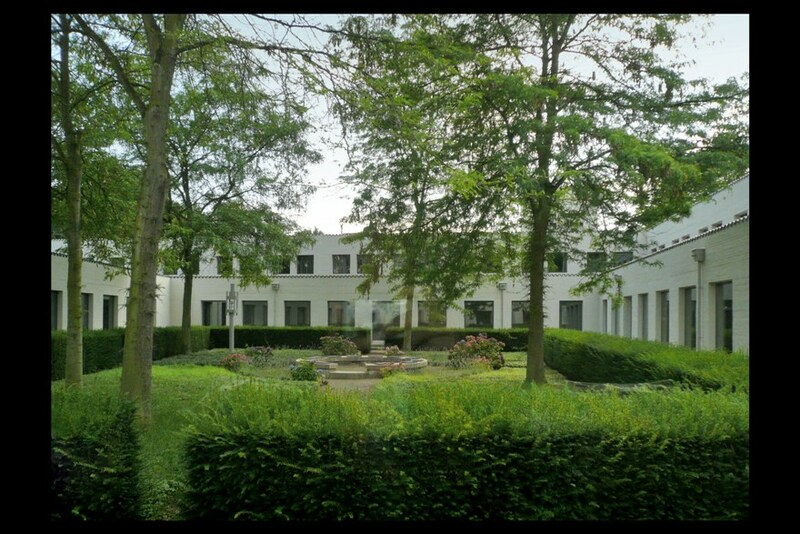 The complex is designed by Dutch architect Dom Hans van der Laan (1904-1991), who created only a limited number of buildings that are, however, all widely admired. 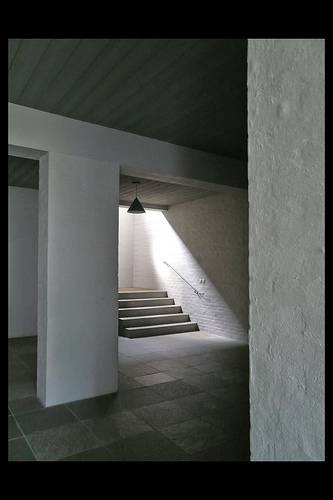 As the brain and motor behind the Bossche School of Dutch Architecture, Van der Laan has gained recognition in his own country and abroad. 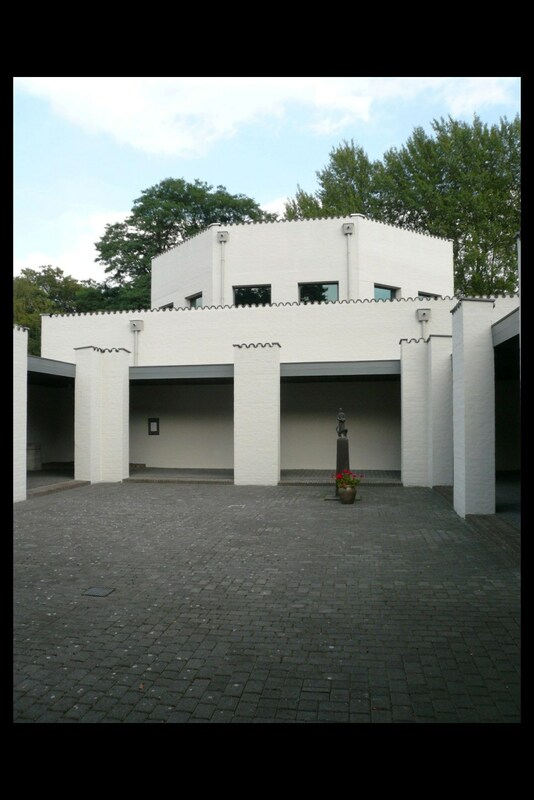 Roosenberg Abbey is the only building that was totally constructed on the basis of the ideas of Van der Laan. This includes literally everything: from the garden to the boards in the cupboards. Every aspect of the inside and outside of the complex is designed by him and brought into balance with each other in order to realize an optimal harmony. My guide around the abbey, sister Rosa, said, ‘Just as a musical composition is constructed on the basis of seven notes, so this building was designed on the basis of the number seven.’ Van der Laan indicated that ‘The property is about 175 meters deep and the front square is about 25 meters wide, which is a ratio of 1 to 7. The width of the corridors is 1 to 7 of that of the front square and the width of the walls of the corridors is 1 to 7 of that of the corridors.’ When walking through the abbey one experiences this rhythm. 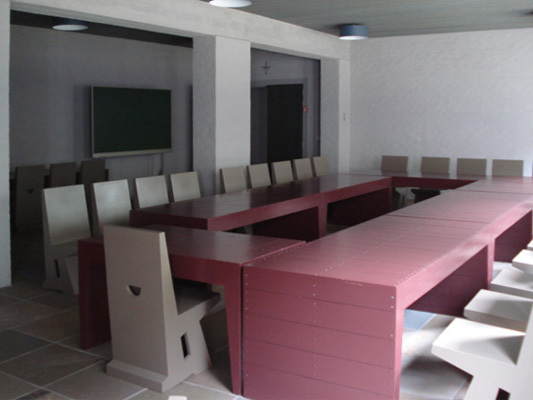 The building instils respect and has its own special personality and feeling. Sober, yet warm. 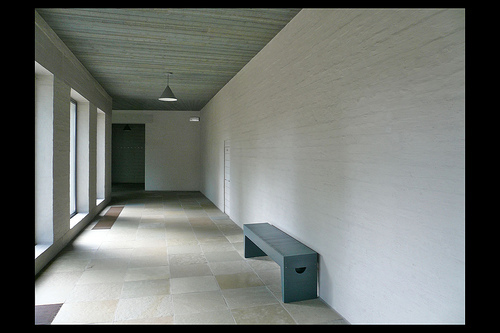 The square in front of the abbey is intentionally kept austere in order to strengthen the feeling of well-being when entering the complex. That’s why the atrium after the gate is a ‘sweet inside,’ although it has no roof and technically speaking is still outside. Van der Laan compares the columns with trees in nature, ‘but adapted to our mind,’ each one with a crown of several roof tiles. These crowns of tiles can be found above all of the outer walls, in combination with the flat roofs lending a Mediterranean feel to the complex. In the inner courtyard Van der Laan sees a ‘new outside’ that is being enclosed by the building. It is the heart of the structure, the hortus conclusus of the Song of Songs, which according to Van der Laan is a beautiful image of the supernatural life or the intimate ‘inside’ that is hidden in our hearts. The proportions of the walls and windows, the furniture, the colours, everything is brought into balance with each other. 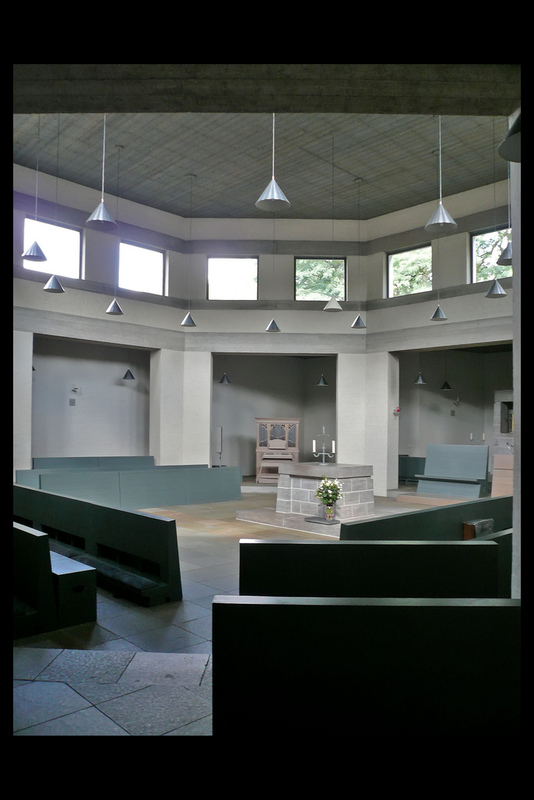 The octagonal church has a gallery and only light that comes from above. While in all of the rooms the light only comes from one side, here it comes from all sides. It is a wonderful meditative space. It is no wonder that Van der Laan quotes Antoine de Saint Exupéry, the famous French writer, poet and aviator, when he compares architecture with liturgy. 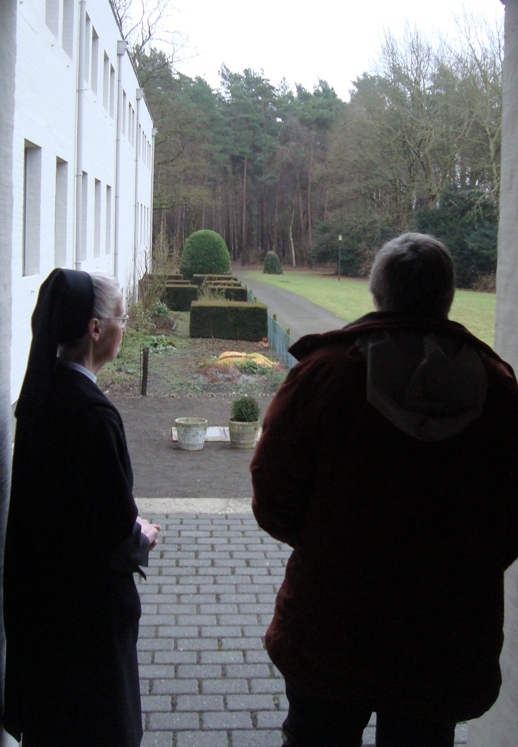 Roosenberg Abbey makes clear that architecture and a lifestyle of devotion can reinforce one another, made manifest not least through the hospitality and dedicated explanation of the sisters. Benedictine monk Dom Hans van der Laan believed like many of his contemporaries at the beginning of the 20th century that a continuation of the neo-styles was no longer possible and that a completely new approach was called for. 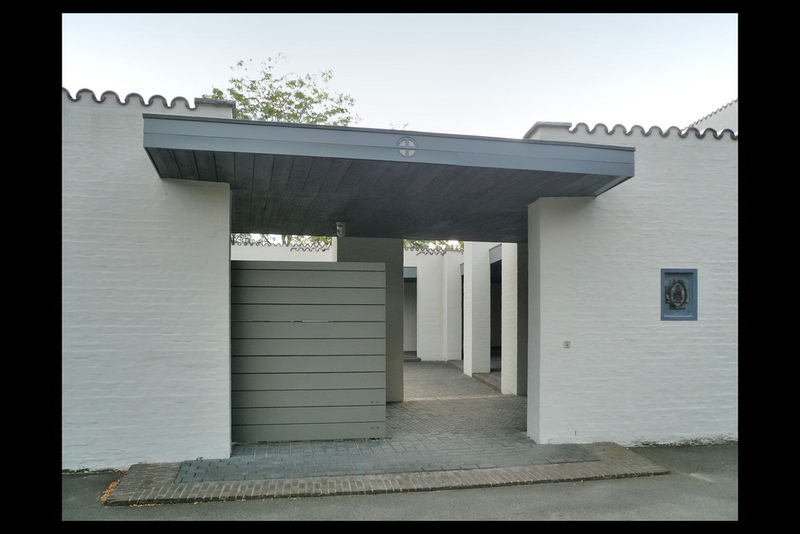 Van der Laan proceeded to develop a new theory of his own, which he described in books and put to practice in a number of impressive buildings, in this way inspiring generations of architects until this very day. According to him buildings are meant to be spaces in which people feel naturally at home. He developed a system of measurements that is based on and corresponds with human perception. Initially he presented this theory during a lecture series in Den Bosch in The Netherlands, hence the name Bossche School came into usage for a group of architects and artists who make use of an idiom of forms based on the Plastic Number, the system of measurements discovered by Van der Laan. For more about Roosenberg Abbey, see www.abdij-roosenberg.be. Albert Hengelaar is Treasurer of the board of ArtWay. Photos: Klaas Vermaas (1,2,4,5,6,8,9), Wikipedia-Spotter2 (3), Albert Truyman (7) and Albert Hengelaar (10).